A space going tug boat, designed for use in orbital assembly shipyards. The audience for the SHIPtember building month is always focused on the Lego leviathans that are published in the Flickr Group. But what of the minifigs who strive behind the scenes, working for a frenzied month to produce these ABS colossi? The Achatina series of space tugs were named after a genus of giant snails because of their shape. Three large main engines powered the ships, with precision manoeuvring being done using the outboard, swivelling thrusters. The cockpit provided excellent visibility, due to its extensive glazing and arrays of large lights. Pieces of SHIP were moved around the construction yards by attaching them to the Achatina tugs via magna-clamps. Each tug had a magna-clamp pad on either side of its hull. This archive photo shows an Achatina towing a piece of SHIP, which has been built using "brick bending" techniques. At the end of a long shift, the tugs would come in to land in the bay of factory yard. These bays were, large, spartan and devoid of unnecessary detailing or greebles. The cockpit was accessed via a hinged roof hatch. The ship's sensor probes had to be folded up first, in order for the pilot's hatch to open. So when you're marvelling at the wonders of SHIPtember, stop a moment and remember the unsung heroes of the SHIPyards, such as the Achatina space tugs. Higher resolution photos can be found by clicking this link to Flickr. 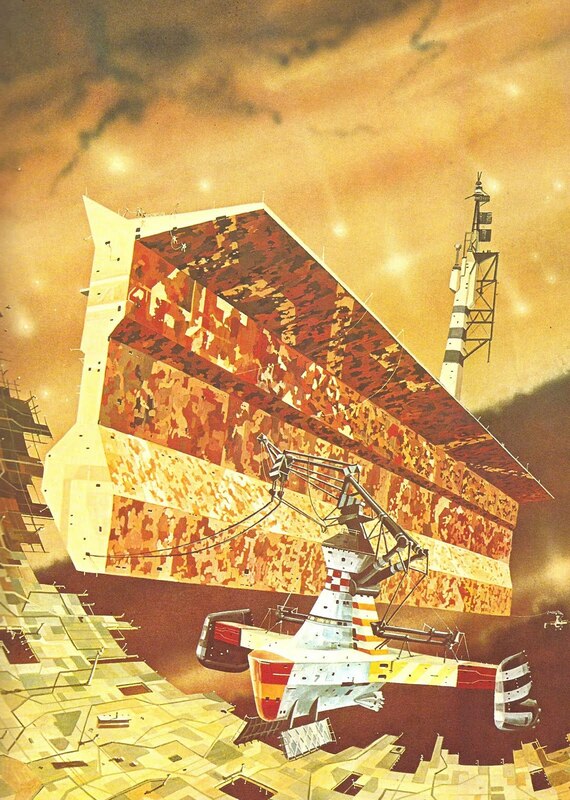 This model was partially inspired by a painting by Colin Hay in the Terran Trade Authority books. I'm liking this just because it's different. I'd like to have these working in my shipyards. These are really great creations David! Ha ha!! Love this little tug!! Thank you for sharing the files. Quoting Clayton Marchetti Awesome ship! I love the rounded parts for the main hull. Very unique look. The dark grey and yellow greebleing top and bottom looks cool. A most necessary vessel. Outstanding job! Also congrats on being blogged! Thanks Clayton! Which blog did you see this on? Awesome ship! I love the rounded parts for the main hull. Very unique look. The dark grey and yellow greebleing top and bottom looks cool. A most necessary vessel. Outstanding job! Also congrats on being blogged! Just freakin' brilliant! These behemoths don't just build themselves, people! Love the idea and the perfect execution, real working class feel to it. Proper workhorse! Quoting Joshua Berger Novel idea! Love the engines! Does that large red section belong to an actual SHIP? Thanks you! Sorry but the red section has all of the red and white 1x2 bricks that I own built into it. I'd love for it to be part of a SHIP but I couldn't afford the Bricklink orders at the moment. Great design with a very practical thrust. Novel idea! Love the engines! Does that large red section belong to an actual SHIP? Quoting Leo Bricks How do you brick bend? Have a look at this website: http://www.brickbending.com/?m=1 You use the tiny gaps between the bricks to gradually curve them over. The gaps are small, so it takes a long run of 1x2 bricks to get a noticable curve. How do you brick bend? Quoting Stuart Lucas All this and brick bending too... I'd been wondering how anyone managed to get those SHIPs put together in time. Now I know! I like the circular design, looks agile enough to turn on its axis and take the load wherever it needs to go. Super! I'm really enjoying this space tug idea. I built one at the start of the summer but it wasn't really up to scratch to publish. I've another one in my head. They're a fun topic. Quoting Jeremy McCreary As Matt Rowntree once wrote in a slightly different context, TUGS RULE! This one's no exception. Love the cargo's Reuleaux triangle cross-section. I'll be studying the link you gave Pico. Thank you! I'll be fascinated to see what you make of those brick bending techniques, with your talent for experimenting and exploring what can be done with Lego! Way to bend those bricks! All this and brick bending too... I'd been wondering how anyone managed to get those SHIPs put together in time. Now I know! I like the circular design, looks agile enough to turn on its axis and take the load wherever it needs to go. Super! As Matt Rowntree once wrote in a slightly different context, TUGS RULE! This one's no exception. Love the cargo's Reuleaux triangle cross-section. I'll be studying the link you gave Pico. Great build and a nice nod to the underdogs of the SHIPtemper universe. Quoting Pico van Grootveld I've got to try that brickcurving technique, looks sharp! Actually just did a BL order with a few hundred green 1x2's :D Cool tug David, it seems very manoeuvrable and agile like it should. These little purposeful builders are indeed often forgotten, nice of you to give them the spotlight! I can't wait to see what you do with all of those bricks. This website is worth a look for ideas: http://www.brickbending.com/?view=magazine I found that building the numbers into the tube really was the limit of what the bricks could take. I wish that I could had added one more brick to each side of the triangle but I had no more red or white 1x2s left! I think that it'll explode when I start to take it apart! Quoting Nick Barrett A behind the scenes unsung hero! Lovely idea, and the styling and part usage here are pure Mr. Red Spaceman. Brilliant. Thank you! I hope STEAM went well! Quoting Stephan Niehoff A beautiful shape, especially at the rear. The lateral steering jets are awesome. And as I see you've been experimenting with the 1 * 2 bricks. Thanks! The tube has every red and white 1x2 brick that I own built into it! I'd love to do some more brick bending stuff but I'd need more brick first, as you have to bend things gently, over a long distance in studs. Quoting D H Awesome tugboat! Great design. Haha, "no unnecessary greebles" in the hangar. Love it! Quoting Jimmie Martinez Positively brilliant build. Highly detailed, great design and color scheme. A professional job of explanation and photography. 10/10. BOAJEWD. Thank you! I've been waiting for over a month to photograph this ship, as the light has been wrong when I've been at home. Quoting Daniel Calleri Loren and I really like this one! In his words 'totally awesome'...and I agree. The rockets are perfect and the landing gear made my day. Thanks! Fitting a folding landing gear was quite important, with all of that space available inside. The swivelling rockets are fun but a bit fragile. I need some of the inverted 2x2 domes and then I could attach them is a stronger, more playable, manner. It would be a fascinating way to build an airtight space station by spiralling out, like a snail shell, getting bigger and bigger. I've got to try that brickcurving technique, looks sharp! Actually just did a BL order with a few hundred green 1x2's :D Cool tug David, it seems very manoeuvrable and agile like it should. These little purposeful builders are indeed often forgotten, nice of you to give them the spotlight! A behind the scenes unsung hero! Lovely idea, and the styling and part usage here are pure Mr. Red Spaceman. Brilliant. A beautiful shape, especially at the rear. The lateral steering jets are awesome. And as I see you've been experimenting with the 1 * 2 bricks. Awesome tugboat! Great design. Haha, "no unnecessary greebles" in the hangar. Love it! Positively brilliant build. Highly detailed, great design and color scheme. A professional job of explanation and photography. 10/10. BOAJEWD. Loren and I really like this one! In his words 'totally awesome'...and I agree. The rockets are perfect and the landing gear made my day.